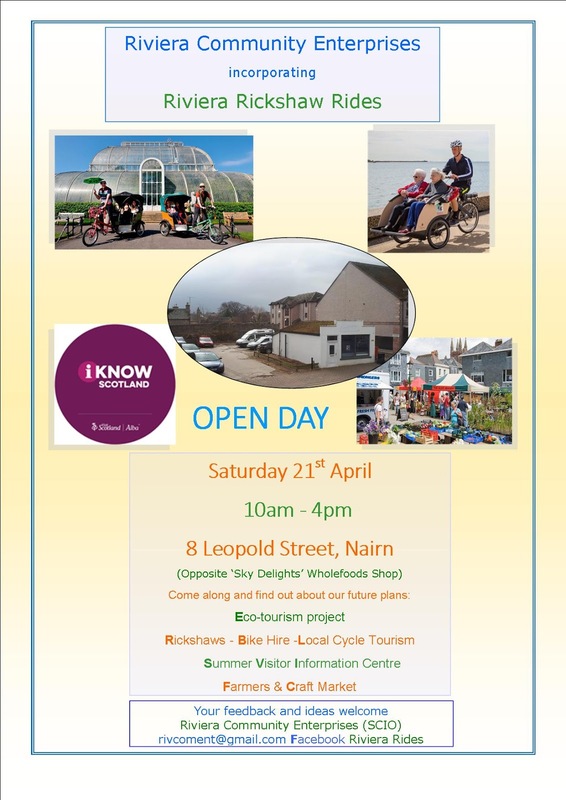 And there will be the same opportunity to find out all about our Eco-tourism project – ‘Riviera Rides’ the rickshaws for tourists and the elderly, mountain and electric bike hire, promoting local cycle tourism. Also exploring the possibility of using part of our premises as a Visitor Information Centre in the summer months as well as the feasibility of holding regular Farmers’ and craft markets in the summer months behind our premises. We’d especially like to hear your feedback and ideas as well as how you might provide valuable support by volunteering to help develop any of the above activities. How often do people say ‘Nairn needs something!’ These activities and facilities will bring something new and needed–but with your ideas hopefully a lot more besides. We're looking for 'out-of-the-box' thinkers and doers especially interested in the local environment, local tourism and local sustainability to help us achieve these goals. So if you’re interested in making Nairn a more eco and tourist-friendly place do come along next Saturday and find out more.